On a sunny hillside in Kent, in the Garden of England, a group of nine migrant workers from various parts of the world are picking strawberries for Mr. Leapish, the farmer. Housed in two trailers, and fed a daily diet of bread, margarine, jam, and sausages, life isn’t easy for them. But the friendships they forge, and their dreams of love and hopes for a new life in the West, carry them along. Nineteen-year-old Irina has arrived from Kiev, Ukraine buoyed up by enthusiasm for the Orange Revolution, and full of dreams of a romantic and refined life in the West. Nineteen-year-old Irina has arrived from Kiev, Ukraine buoyed up by enthusiasm for the Orange Revolution, and full of dreams of a romantic and refined life in the West. Andriy, from Donetsk in Eastern Ukraine, has fled a harsher life—and maybe death—in one of its failing coal mines. Yola, the sharp-tongued but warm-hearted supervisor, has come from Poland with her gentle niece, Marta, to earn money to support her disabled son. Tomasz, also from Poland, is a latter-day aging hippie and Bob Dylan fan following his own dreams of freedom. With them are two Chinese girls and Emanuel, a devout young Catholic from Africa, seeking his sister, who is working somewhere in England as a nurse. The mysterious Vitaly, of unknown Eastern European origins, and a runaway dog round out the bunch. Although the tone is often humorous, and the action moves fast, there is an underlying seriousness in this modern tale of globalization, where people are expendable, and the worst exploiters are often other immigrants, traffickers in cheap labor and worse, who prey on the vulnerable new arrivals. 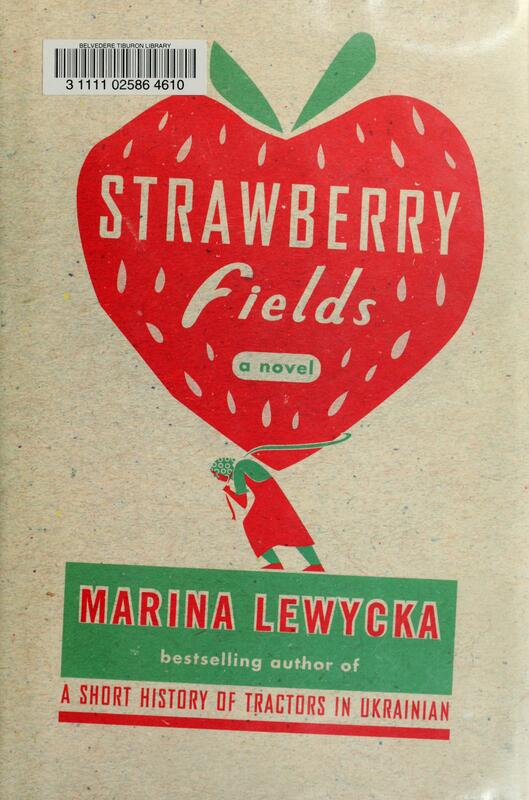 Author Marina Lewycka creates comedy from the language and cultural differences of this ragtag group, while never flinching from describing the horrors they encounter when they are forced to leave their idyllic strawberry field and embark on an adventure which takes them through an England that turns out to be very different from the country of their dreams. Strawberry Fields is both a road story and a love story. As each one of the original strawberry pickers is forced to let go of some of their illusions about life in the West, they gain friendship, love, and a better understanding of their own nature. Before they can finally extricate themselves from the clutches of the gang masters and go their separate ways, the group has the bittersweet journey of a lifetime, tinged with hope, joy, tragedy, and love. Marina Lewycka was born to Ukrainian parents in a refugee camp in Germany shortly after World War II. She and her family emigrated after her birth to England, where she grew up. Her first novel, A Short History of Tractors in Ukrainian, has sold more than one million copies worldwide, has been translated into more than thirty languages, and was nominated for the Booker and Orange prizes. She lives in Sheffield, Yorkshire, with her husband, and has one adult daughter. Each of the characters in Strawberry Fields has a very distinctive voice. All of the characters’ stories are intertwined, but they each develop separately. How does the fact that each character’s story and voice unfolds independently affect the narrative of the novel as a whole? Does it make it easier or harder to understand how the characters relate to each other? Andriy and Irina are both Ukrainian, but they are clearly from different sides of the tracks. At the beginning of the novel, Irina looks down on Andriy, and Andriy thinks of Irina as stuck-up. But as the story progresses, they grow to appreciate and even love each other. How did you react to their blooming romantic relationship? Do you think their adventures together allow them to put aside their differences, or did they create an artificial closeness? All of the workers on Leapish’s farm are migrant seasonal laborers, but none of them seem to know exactly what they have gotten themselves into. Was this initial setup believable? Did the following events make the story more or less plausible? Vitaly is a strange character—first he seems to be one of the Leapish crew, but then he seems to turn against them, becoming a “mobilfonman.” He coerces many of his less savvy friends into bad jobs in worse conditions. And yet, as we find out something about Vitaly’s life, we learn that he has been just as much a victim of the system as those he is taking advantage of. Did you sympathize with Vitaly? Do you think he could have helped his behavior? How would you have acted in his situation? In the novel’s epigraph, Lewycka quotes Chaucer: “For myn entente is nat but for to pleye.” The tone of the book is indeed lighthearted, but Lewycka brings up some very serious social and political issues. Does her political stance come across strongly? How did some of the situations she presents in the novel change your mind about real-world politics? Like many novels, Strawberry Fields is about a journey. In what ways do the real journeys the characters take—from their native lands to Leapish’s farm, to various parts of Europe, and sometimes back home—stand in for their emotional or psychological journeys? Vulk is obsessed with “making possibility” with Irina. He is a frightening and revolting character, but he seems to have a genuine crush on Irina. Because of this, is he a sympathetic figure? What are some of the characteristics that would elevate him from the position of merely “bad guy”? One of the stranger episodes in the novel occurs when Emanuel, Irina, Andriy, and Dog show up on Toby Mackenzie’s doorstep. Toby’s family seems stereotypical—an overbearing father, a repressed but kind mother, and a rebellious, drug-using teenage son. Was the author’s description of the family funny, upsetting, or a combination of both? What about the immigrants’ reactions to the family? In what ways was the scene realistic? Discuss Emanuel’s and Marta’s religious convictions. Do their religious beliefs make them harder or easier to understand? Why do you think the author chose to include two devout Catholics from such different backgrounds? Do you think the subject matter of the book works best as a novel? Would it have been more powerful as non-fiction—for example, an exposé of immigrant life? What did you think of the characters’ reactions to Western culture? Were their impressions accurate? Which character did you relate to best and why? Was there any character you disliked? Did the story have a clear hero? A villain?